Today, we spent the day traveling to Matagulpa. Once there, we visited the EOS office where we'll be working and then settled in with our host families. On this trip so far we have learned about sustainable development, the political history of Nicaragua, and bucket showers—knowledge which will hopefully be useful in the future. So, when we left Managua on Friday morning, we were all a bit weary from the previous long day, but ready to learn and see more. This morning, my host family saw us off with a breakfast of pancakes and fresh fruit (not the kind of meal we had expected to eat) before we departed on a 3-hour bus ride for San Isidro where we will stay for the next two weeks. The drive was filled with views of the Nicaraguan countryside and its livestock. The sight of a pig lying down underneath a tree was the highlight of the drive for several members of the class. For lunch, we stopped at a hotel near Matagulpa, where we all learned some Spanish phrases from a group member's English to Spanish dictionary. 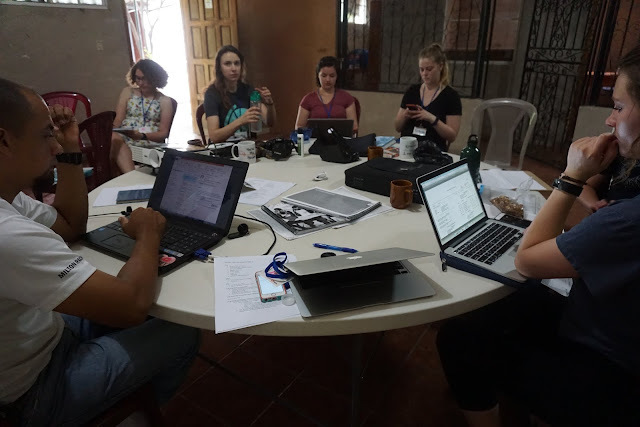 Today was the first day we saw the EOS office as well, where many group members eagerly connected to WiFi which we hadn't had access to in two days. The most exciting part of the day was meeting our host family. Many of our class members were welcomed by signs that said "Bienvenidos" or "Welcome" and all of our host families seemed eager to meet us and to show us our new temporary home. At my home, my host sister Deyanira showed us to our room before we had dinner, which consisted of rice, beans, and chicken, which seems to be a staple in Nicaraguan cuisine. After a long day of traveling, we were finally settled in our temporary homes.